(Nanowerk News) Diamonds is the strongest naturally occurring material on Earth. It is also renowned for its incomparable properties, such as high stiffness, exceptional thermal conductivity, high chemical resistance, and high optical transparency. Although these remarkable properties of diamond make it highly desirable for many scientific and technological applications, progress has been slow due to its brittleness. A recent study, affiliated with UNIST has unveiled that brittle diamonds can be bent and stretched elastically when made into ultrafine needles. 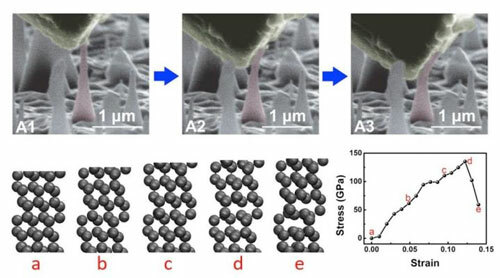 This breakthrough has been jointly conducted by Distinguished Professor Feng Ding's team from the Center for Multidimensional Carbon Materials (CMCM), within the Institute for Basic Science (IBS) at UNIST, in collaboration with an international team of researchers from Massachusetts Institute of Technology (MIT), City University of Hong Kong, and Nanyang Technological University. The results of the study has been reported this week in Science ("Ultralarge elastic deformation of nanoscale diamond"). The team demonstrated that their nanoscale diamond needles could flex and stretch by as much as nine percent without breaking, then return to their original shape. Their discovery completely overturns previous theories that diamonds are brittle. Their results, the research team say, could open up unprecedented possibilities for tuning its optical, optomechanical, magnetic, phononic, and catalytic properties through elastic strain engineering. "Ultrahigh elasticity of diamond is due to the paucity of internal defects." Ordinary diamond in bulk form has a limit of well below one percent stretch, according to the researchers. In the study, Professor Ming's group handled the chemical calculation and the analysis of the crystal structure of diamond and ascribed that the ultrahigh elasticity of the diamond nanoneedles is due to the paucity of internal defects and the relatively smooth surface. "Diamonds, either natural or artificial, have internal defects in their crystal structure," says Professor Ding. "When outside force is applied to these defects, they can crack and eventually break." 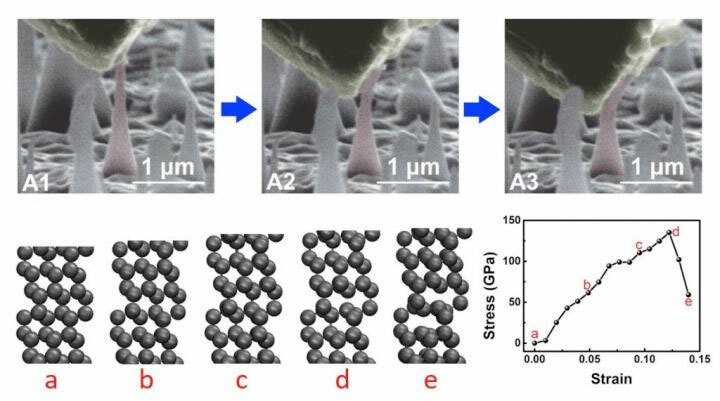 In the study, via detailed simulations, Professor Ding determined precisely how much stress and strain the diamond needles could accommodate without breaking. He determined the corresponding maximum local stress was close to the known theoretical limit achievable with a perfect, defect-free diamond. He noted that defect-free diamonds can stretch by as much as 12% without breaking. "Diamond needles stretched and flexed as much as 9% without any breakage." The research team from the City University of Hong Kong succeeded in fabricating nanoscale diamond needles by plasma-induced etching of diamond thin films deposited on Si substrates through bias-assisted chemical vapor deposition (CVD). As a result, the team was able to demonstrate ultralarge, fully reversible elastic deformation of nanoscale (~300 nanometers) single-crystalline and polycrystalline diamond needles. The team measured the bending of the diamond needles, which were grown through a chemical vapor deposition process and then etched to their final shape, by observing them in a scanning electron microscope while pressing down on the needles with a standard nanoindenter diamond tip. 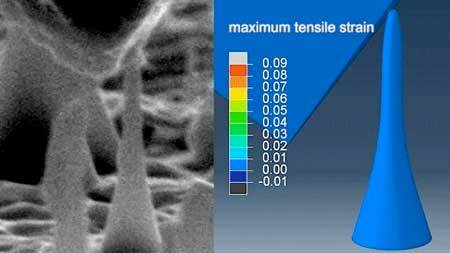 They demonstrated experimentally that single-crystalline needles are simultaneously ultrastrong and susceptible to large elastic deformation, with fully reversible mechanical deformability of up to a maximum of 9% of elastic tensile strain. The research team expects that their findings could lead to performance enhancement in applications, involving bioimaging and biosensing, strain-mediated nanomechanical resonators, drug delivery, data storage, and optomechanical devices, as well as ultrastrength nanostructures. Besides, Professor Ding noted that large elastic deformation in nanoscale diamond needles will be suitable for use in next-generation flexible and foldable displays.